Video: Single dad Tusshar Kapoor looks super cute as he celebrates Ganesh Chaturthi with son Lakshya! 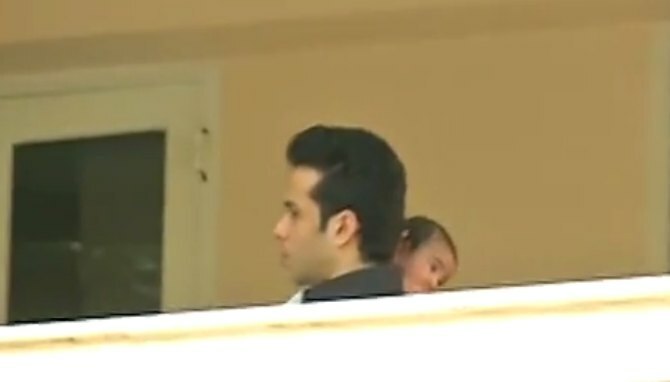 Tusshar looked every inch on a doting single dad as walked around his balcony with son Laksshya in his arms. One of the stars who celebrated Ganesh Chaturthi in a big way was new dad Tusshar Kapoor as it was his first Ganeshutsav with son Lakshya. Tusshar also gave a first glimpse of his son Laksshya who was born on June 27, 2016 via surrogacy. The father-son duo looked super cute as they posed for pictures on the balcony of the house. Earlier in the day father and son Tusshar and Jeetendra worshipped Lord Ganesha as the marked the beginning of the 10-day Ganpati celebration at their home. Dressed in a very traditional attire, a white dhoti, a shawl and janeu, the father and son made a very pretty picture as they stood in front of Lord Ganesha with folded hands. Sister Ekta posted a very adorable picture of the two on her Instagram account captioning it: “Moments like these……????”. Later in single dad Tusshar took on his parenting duties and was seen pacifying his son Laksshya as he moved around in the balcony. It is evident that the new father is really excited to be a parent and he had shared his excitement earlier as well. Speaking to the media Tusshar said, “My son looks exactly like me. So, it makes me very, very happy and I don’t have words to express how excited or how joyous I am,” said a thrilled Tusshar. Continue reading on the next page to see the video of Tusshar pacifying his son! Tusshar’s decision to become a single dad was applauded by everyone including the Bollywood fraternity. “I will be turning 40 in a few months. I feel that I am in the right stage of my life to be a single parent,” a happy Tusshar had told reporters at the birth of his son. Here is the video of the father-son duo, Laksshya and Tusshar, taken during the Ganesh Chaturthi celebrations at their house. Laksshya’s grandparents Jeetendra and Shobha Kapoor had also shared that they were really happy to welcome their grandson. “We could not be more excited to be grandparents to Laksshya, and are completely supportive of Tusshar’s decision. This is certainly a tremendous blessing, and an exciting time in our lives. Tusshar is a wonderful son, and he has proven, with responsibility, independence and kindness, that he will be a great father to Laksshya,” they had said at the birth of Laksshya. Being a single parent is not an easy task, but we must say that by the looks of it Tusshar seems like a pro at handling babies. Perhaps he can take a few tips from fellow Bollywood actor Sushmita Sen who is also a single parent and is showing the world how to raise independent and confident daughters.